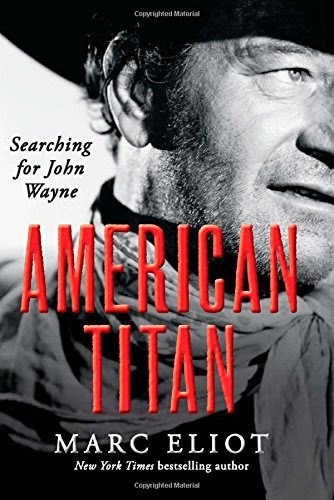 Judging by how fast she ripped through it — and by how much of it she read aloud to me — Katie-Bar-The-Door gives two thumbs-up to Marc Eliot's recently-published biography of the Duke, American Titan: Searching for John Wayne. Criminally-underrated in his lifetime, many classic film fans have come to see that Wayne was actually one of the greatest actors in movie history. Why just last week, Entertainment Weekly included his turn as Ethan Edwards in The Searchers as one of the biggest Oscar snubs of all-time. He'd win my alternate Oscar for that one. 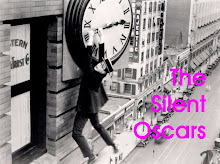 For which performance should John Wayne have won an Oscar? 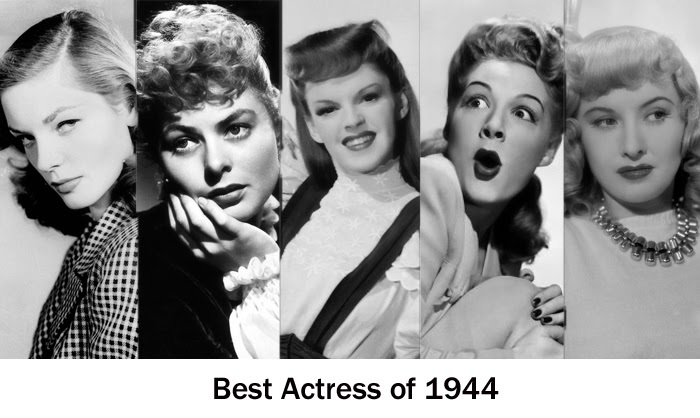 1944 was a very good year for actresses. 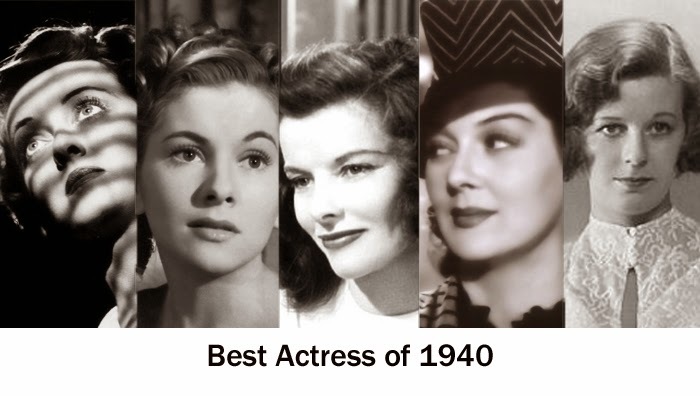 The list of those I didn't nominate — Joan Bennett (The Woman In The Window), Claudette Colbert (Since You Went Away), Bette Davis (Mr. Skeffington), Joan Fontaine (Jane Eyre), Elizabeth Taylor (National Velvet), Gene Tierney (Laura) — would make a pretty good slate all by themselves. 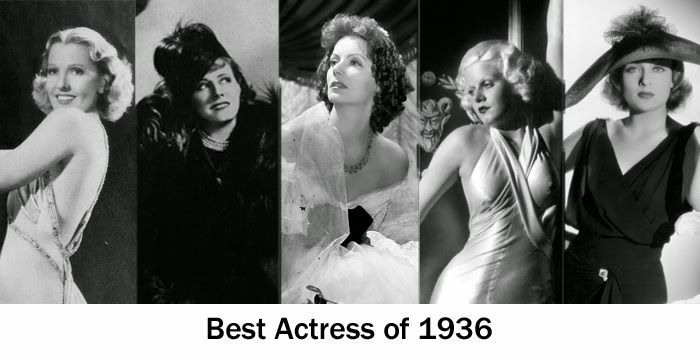 Can you imagine a lineup that strong coming of today's Hollywood? Actually, she wasn't, and that's the problem. No doubt like you, I've been wanting to see Norma Talmadge's biggest hit, Smilin' Through (1922), for a long time but to my knowledge, you can't buy it on DVD and it turns out the only copy I could find is in the Dutch Film Archive. With intertitles in Dutch, a language I don't speak. "Nu veertig jaar geleden ... op een mooien Junidag ... was ik de gelukkigste man ter wereld ... Monica en ik zouden worden vereenigd in den echt." That's easy for him to say! Fortunately, the Google knows all and with the help of its Translate site, I've been slugging my way through. Good movie. I think — it's hard to tell. If God had meant us to watch movies in a thirty second burst followed by an eight minute interruption, he would have given us AMC in the womb. 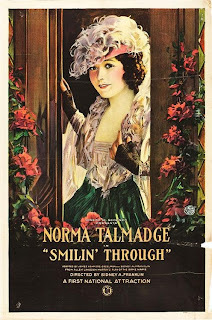 You can watch Smilin' Through here, but as for the translation, well, all I can say is, "Son, you're on your own." 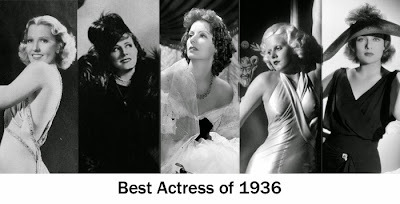 I started this vote over, so all you Greta Garbo and Mary Pickford fans, you'll have to duke it out again. 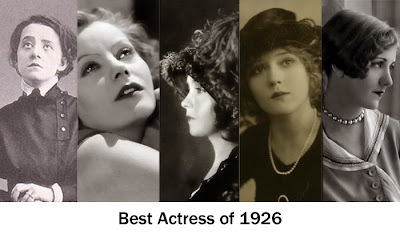 And if you're eager to vote for the best actress of 1925, click here. Seven new participants in the Favorite Classic Movie Actress Tournament. 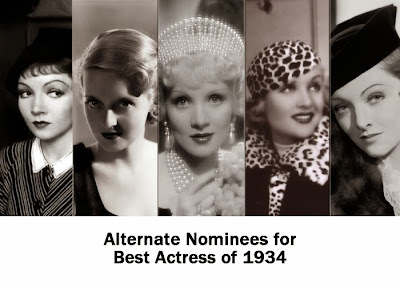 Other possibilities included Ruth Chatterton (Dodsworth), Bette Davis (The Petrified Forest), Myrna Loy (After The Thin Man and Libeled Lady), Ginger Rogers (Swing Time) and Sylvia Sidney (Fury and Sabotage). 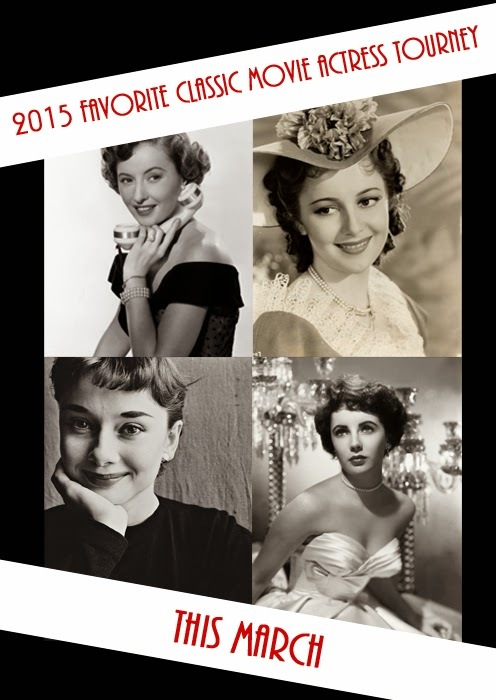 You can find and vote in previous polls by clicking here. I started putting these polls together a while back, got busy, forgot. Think I'll revive them in the run up to the Favorite Classic Movie Actress Tournament which begins in March. A shake down cruise, if you will. The nominees are mine rather than the Academy's. The winner is up to you. Voting never closes. I think it's possible to share the poll on your own blog or Facebook page, but I'm not sure — just how tech savvy do you expect a Monkey to be? 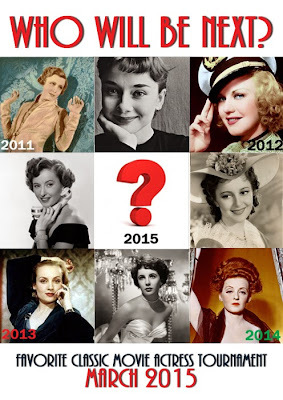 Monty of All Good Things is once again hosting his annual Favorite Classic Movie Actress Tournament this March. 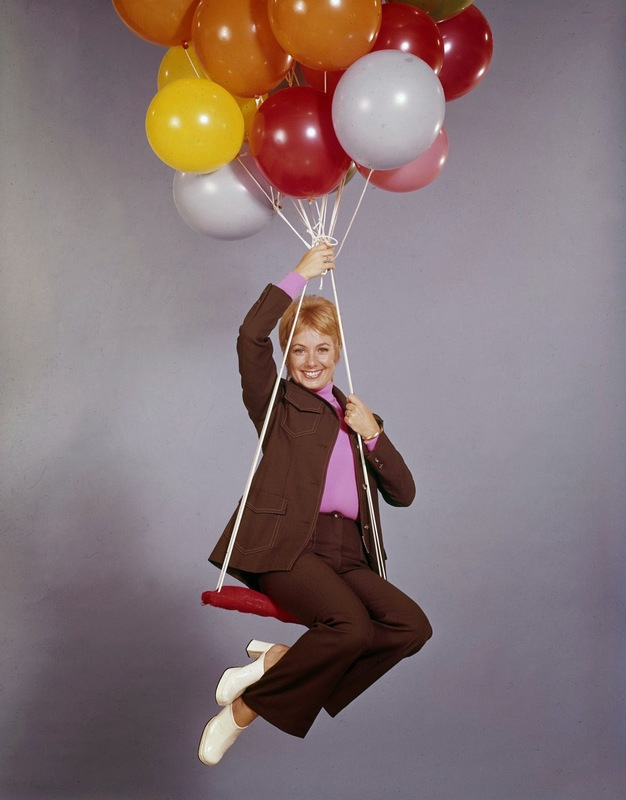 We here at the Monkey are proud to be handling the 1960s bracket. Julie Andrews (Mary Poppins). I could have also gone with The Americanization of Emily and The Sound of Music. 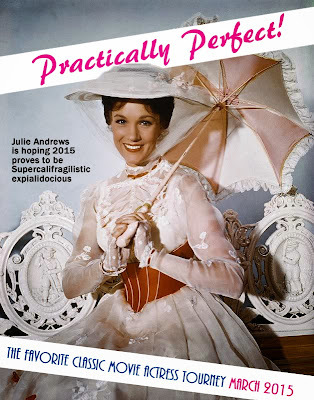 Supercalifragilisticexpialidocious, indeed! 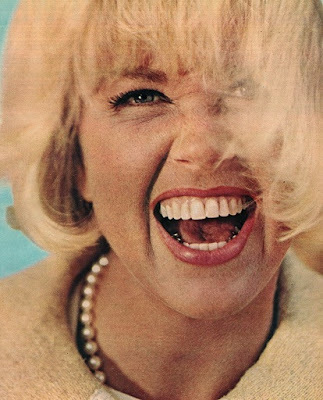 Doris Day (Lover Come Back). 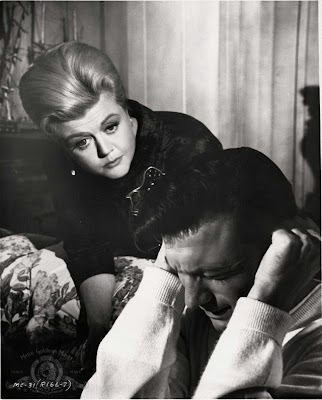 I prefer this pairing with Rock Hudson even over Pillow Talk. Audrey Hepburn (Breakfast at Tiffany's). 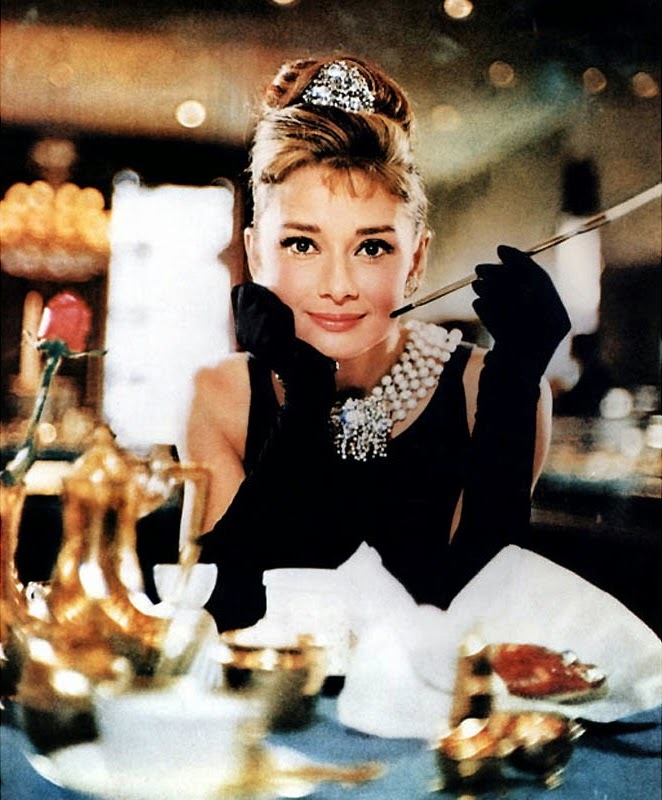 Charade is another personal favorite, but the scene where Holly Golightly crawls through the window into George Peppard's bed puts this over the top. 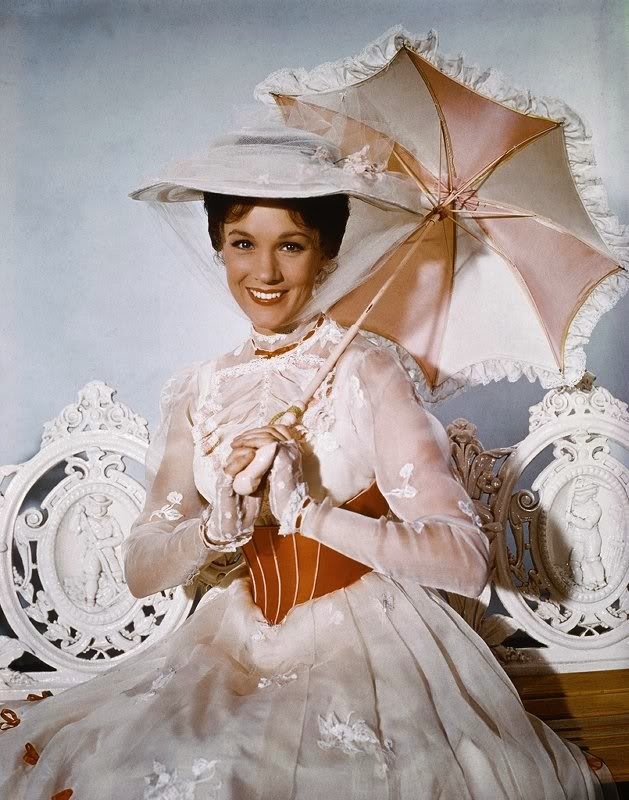 Sally Ann Howes (Chitty Chitty Bang Bang). A doll on a music box. 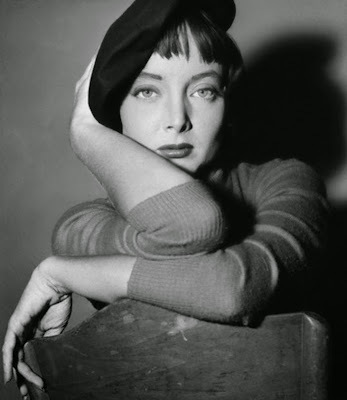 Carolyn Jones (Television's The Addams Family). Katie-Bar-The-Door and I have modeled our marriage on Carolyn Jones' Morticia and John Astin's Gomez. 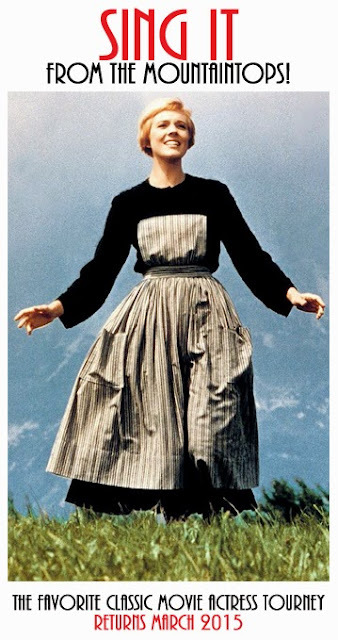 Without the seven-foot butler. 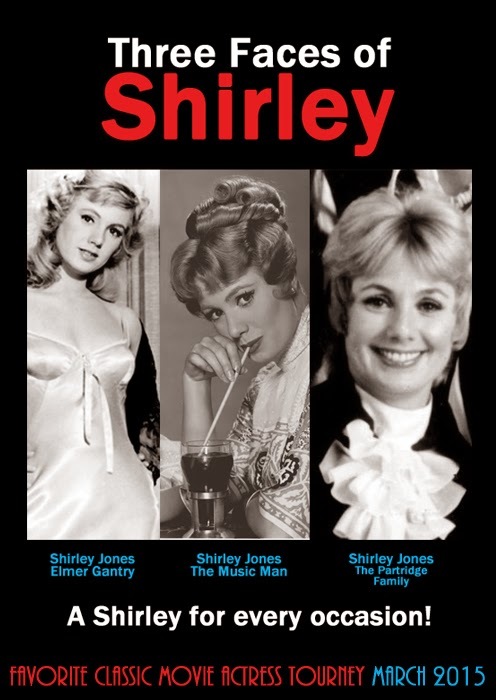 Shirley Jones (The Music Man). Serves me right for not being musical. 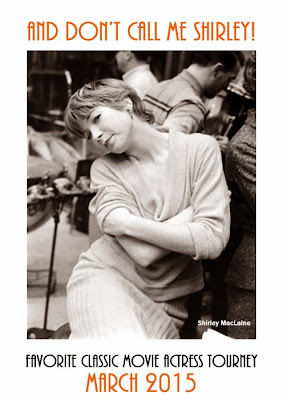 Shirley MacLaine (The Apartment). 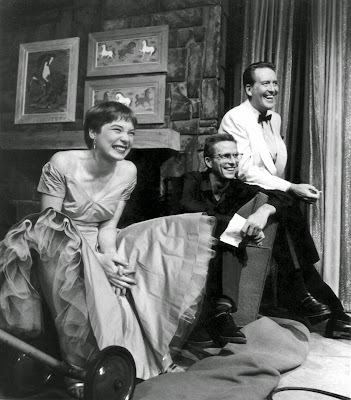 Probably my favorite performance from the 1960s. 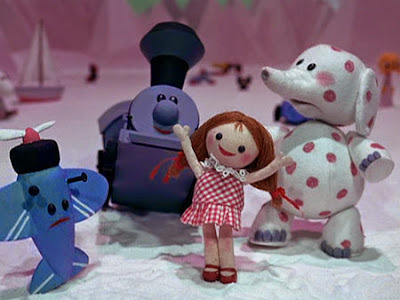 Misfit Dolly (voiced by Corinne Conley) (Rudolph the Red-Nosed Reindeer). Who among is so hard-hearted not to be moved by the tears of a doll? Especially a red-headed doll? 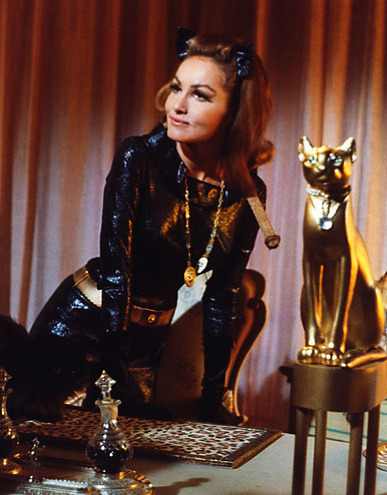 Julie Newmar (recurring role on TV's Batman). Julie Newmar's stoner Catwoman and Frank Gorshin's speed-freak Riddler are two of the greatest comedy villains of all-time. Paula Prentiss (Man's Favorite Sport?) I'd go fishing with Paula Prentiss any day. Diana Rigg (On Her Majesty's Secret Service). You should also check her out in Theatre of Blood, a Vincent Price masterpiece. Tippy Walker (The World Of Henry Orient) One of the most poignant performances of the decade. Read about this great lost talent in The New Yorker (here). The 2015 Favorite Classic Movie Actress Tournament starts up again in March. I'll be hosting the 1960s bracket this year.